The Canal network in this country - or most of it - came into Government ownership several generations ago. 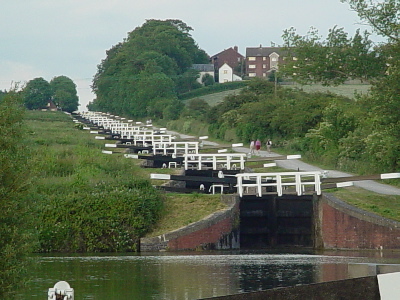 In those days, the canals were used for the carriage of goods, but were something of a failling industry; whilst a necessary part of the nation's infrastructure, they were a financial burden to their owners - mostly the railway companies - who were themselves in quite deep water after the ravages of the second world war. So government ownership was probably the correct, logical, best thing for them. "This consultation seeks views on how, in future, the inland waterways in England & Wales that are currently managed on behalf of the Secretary of State for Environment, Food and Rural Affairs, will be run. It sets out the rationale for moving these waterways out of the public sector and into a new civil society organisation, and the principles which will guide the Government in deciding on the way forward. Now - I've been an ordinary member of the Inland WaterWays Association and the Kennet and Avon Canal Trust for many years - they're both charities themselves, and both have done impressive work. Without the IWA, waterway holidays would probably never have come about and we would cetrainly not have the rich network that still exists and is heavily used. And without the K&A Trust, the canal that passes near Melksham on its way from Bristol to London via Bath and Reading would have seen its last boat in 1950. But organisations such as these - and there are many more around the country - are placed in something of a dilemma. If the Waterways operation becomes a charity, it will cause confusion as to which charity does what, and their newsletters already speak of them finding competition for funding from sources which previously weren't tapped by the Waterways Boad, but could be tapped by a new charity set up by the government. What should organisations like the K&A Trust do? Should they roll themselves into the new charity? Should they carry on as they are? Should they restrict themselves in future to the things that the new charity clearly won't do, such as running trip boats, and leave things like helping with restoration and maintainaince and improving signage and footpaths to the new goverment-endorsed charity? They would like your views if you're a member - see http://www.katrust.co.uk/index.html with a link to the survey [here] ... and there are meetings on 12th, 16th and 17th to explain and discuss the options too if you would like to learn more. Preserved railways - struggling to the future?